App-V vs. Terminal Services – Which one, when? Both App-V and Terminal Services/Remote Desktop Services can reduce the amount of time an IT Professional spends installing, managing and troubleshooting applications on desktops. Both technologies allow you to install, upgrade and manage an application in one place (on a server) and allow multiple users access to those applications. And then the similarities start to end. Terminal Services/RDS is based on session hosting. The users must establish a session with the host server to access the application. Depending on what version of Windows Server you are using, the applications can appear on the desktop seamlessly using either RemoteApp or other 3rd party technologies. While this is great for workers who are located locally in the office or are regularly connected via the Internet from another location, the applications are not accessible when the client machine is working offline. App-V streams the packaged applications to the client machine, which are then cached locally for use while working on or offline. The applications can be managed and updated on the server side and the client machines receive updates when they reconnect. This allows for better control of the overall software lifecycle and ensures that every client is running the approved version of any given application. When it comes to support for legacy applications, especially those that will not run on Windows 7, App-V isn’t necessarily going to be the solution. Any application streamed from App-V must be sequenced and packaged for the destination operating system, though I’ve heard of some success with XP-sequenced apps working on Windows 7, so your mileage may vary. App-V requires the applications to interact with the client operating system in order to take advantage the local system resources. This is also important for applications that must interact with each other and with the local drivers on the machine, to deliver an experience similar to having the application installed in the traditional fashion. Legacy applications aside, what if all your applications are Windows 7 ready? Can RDS make more sense than App-V? First, you have to consider your users. Do the work online or offline? Do you have the RDS infrastructure to support having EVERYONE access applications during the work day? Having everyone access hosted applications is resource intensive on the server. If you currently have an implementation that used for only a few remote workers or for little used applications you’ll have to look closely at how much those servers will be able to support. App-V might be a better fit if you want to take advantage the resources on the local machines instead. You can also combine App-V with Remote Desktop Services to make better use of server farm resources. Ultimately, there are a lot of different ways to deliver software to your end users and it doesn’t have to involving managing applications on each desktop. Can MED-V take on Terminal Services? Microsoft Enterprise Desktop Virtualization is a great way to manage the deployment of applications that will not run on Windows 7, but run on Windows XP. By providing a managed, virtual, integrated copy of Windows XP running inside Windows 7, users can still access a legacy application seamlessly from their desktop. However, MED-V is not the ultimate solution to getting legacy applications to run on Windows 7 indefinitely. Its a way to get Windows 7 onto desktops without being held back by a specific application that is not yet ready to be upgraded, replaced or phased out of use. But what if you already have the application available through Terminal Services? You may be running Citrix on Server 2003 Terminal Services. Or maybe the application will run on Vista and can be deployed using Server 2008 TS RemoteApp. Both those options are easier to manage than deploying and managing a host of extra virtual Windows XP machines on your network, especially if you already have an appropriate Terminal Services environment available. MED-V is a tool to consider if you are Software Assurance customer, because access to the MDOP tools cost only about $7-8 per desktop. This can be cheaper than the cost of Terminal Service or Citrix CALs, unless of course, you already own those CALs. MED-V and Terminal Services aren’t competing solutions for the same problem. But they can help you accomplish the same goal – getting your users working on Windows 7. Terminal Services 2008 introduced Easy Print, a feature that doesn’t require print drivers for local printers to be installed on the remote terminal server. Instead Server 2008 redirects the default printer from the local machine and utilizes the locally installed driver. While this works well for a lot of printers, printers that need legacy or specialty drivers (like those handy multi-function printers), may result in print jobs are garbled or use incorrect fonts. The first troubleshooting step should be to update the the print drivers on the client computer, but if this isn’t possible, the default behavior of Easy Print can be overridden with some registry keys and some GPO settings. Also, in some cases, the correct print driver still produces bad print results so you’ll need to use a different driver. The following steps will override Easy Print, utilizing a driver installed on the server instead AND force a substitution with a different driver. "OEM Printer Driver Name" = "Windows Server 2008 Driver Name"
"HP DeskJet 720C Series v10.3" = "HP DeskJet 722C"
The left side of the equation is the exact name of the printer driver associated with the client printer that is being redirected to the server. The right side of the equation is the exact name of the server-side driver that is installed on the terminal server. You’ll have to check your printer driver properties to make sure you have the names right. Next, you’ll need to add a few registry values to your terminal server. Locate the HKEY_LOCAL_MACHINE\SYSTEM\CurrentControlSet\Control\Terminal Server\Wds\rdpwd registry subkey. You must restart the Print Spooler service on the terminal server for the changes to take effect. If you need more details about this process, check out Event 1111 – Terminal Services Printer Redirection on TechNet. Finally, you’ll need to adjust or create a group policy that will alter the behavior of Easy Print for all of your TS users. There are several additional policies that can be enabled to tweak how client machines handle Easy Print. The one you want to adjust “Use Terminal Services Easy Print Print Driver First” and you’ll want to disable it. This will force clients to look for appropriate drivers on the server first and only use Easy Print if no suitable driver is found. It doesn’t disable Easy Print entirely, just makes it the second choice. Depending on which OS you are using as your GPO management workstation, you’ll have to look in for the policy in one of two places. 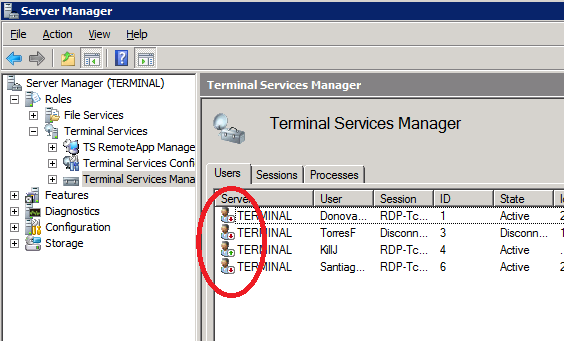 The discrepancy is related to the renaming of “Terminal Services” to “Remote Desktop Services” with Windows 2008 R2. The registry settings that the policy adjusts are the same. For Vista or Server 2008, go to Computer Configuration –> Policies –> Administrative Templates -> Windows Components –> Terminal Services –> Terminal Server –> Printer Redirection. On Windows 7 or Server 2008 R2, go to Computer Configuration –> Policies –> Administrative Templates –> Windows Components -> Remote Desktop Services -> Remote Desktop Session Host ->Printer Redirection. In our case, we were unable to find the setting at all using Windows Vista and we don’t have a Windows 2008 server running GPMC to compare it too. However, we simply made the adjustment using a Windows 7 workstation instead. For other troubleshooting tips with Easy Print, check out the RDS Team Blog. Now that I’ve been actively working to move people from our aging Citrix setup to Server 2008 Terminal Services, I’ve been spending some more time in Terminal Services Manager. While there, I’ve noticed that outside of my adminstrator level account, all the connected users have an icon with a red down arrow next to them. My first thought was that it was a licensing issue, so I checked the terminal services licensing server. We license by device and everything seemed to be in order. My next stop was a search on the internet, where I turned up this lone post on eggheadcafe.com. The reply about it being a “known issue” is not terribly outdated so I’m just going to let the red arrows be for a while and move on to other things. Don’t forget the PacITPros regular meeting this Tuesday (tomorrow!) at 6:00pm. I’ll be doing a quick presentation regarding Remote Desktop Services (on Windows 2008 R2) and we’ll also be hearing from Ed Horley on Windows 7 Deployment and an overview of the Application Compatibility Toolkit. This meeting is a Microsoft STEP event, so be sure to check out the details and RSVP!